Researchers have investigated novel nanoribbon europium aluminate compounds that exhibit new compositions, crystal lattice structures, and luminescence properties and mechanisms. These materials luminesce blue, green, and orange under ultraviolet light. Luminescent nanoribbons under ultraviolet light (on bulk nanoribbons) and their synchrotron X-ray microbeam excitation (on individual nanoribbons). Background image is a Laue microdiffraction pattern. 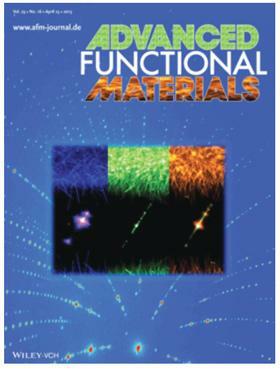 The research was published in the journal Advanced Functional Materials a month ago, and a press release from Oak Ridge National Laboratory (ORNL) brought it to wider notice. The researchers used synchrotron radiation from the Advanced Photon Source at Argonne National Laboratory to investigate the structure of the crystalline luminescent nanoribbons by X-ray diffraction analysis. The nanoribbons are grown as crystals from powders. The exact recipe of powder composition, temperature, gases present, etc., affects the end products' luminescence in ways that can't now be predicted. The team is doing basic research using atomic-scale X-ray probes in order to try to understand how the electrons around the atoms interact to make light. Without access to the full paper (which requires a subscription or payment), I can't guess how readily the production of these and similar materials would scale up for commercial use in LED phosphors. ...blue luminescent EuAl6O10 with a new composition and a new tetragonal lattice structure, green luminescent EuAl2O4 with a monoclinic lattice structure, and orange luminescent EuAl2O4 with a new hexagonal lattice structure and extremely large band width and Stokes shift of emission. The figure below (adapted from the paper's supporting information) shows room-temperature emission spectra for the three phosphors, as illuminated by UV light at 365nm (solid lines) and by synchrotron X-rays from the Advanced Photon Source. Room-temperature emission spectra of b-EAO, g-EAO and o-EAO nanoribbons under the excitation of 365 nm ultraviolet light (solid line curves) and synchrotron x-ray beam (dashed line curves). The units on the vertical scale are arbitrary. I hope we can read this figure as indicating that the peak intensities of all three phosphors are similar. If so, it looks to my eye like it might be possible to get a reasonable approximation of warm white out of these phosphors. They might be a good match to the prospective ultraviolet p-ZnO LEDs that Brian Coppa described here recently. According to the researchers, the luminescent nanoribbons also have promise as light pipes (when the crystal quality is high enough) for use in optical signaling and fiber-optic applications.